Breaking Bad, in this fourth season, finds Walt (Bryan Cranston) and Jessie (Aaron Paul) at odds with their boss, Gus (Giancario Esposito). After a botched event, Gus wants Walt and Jessie dead….or so they think he does. The season essentially finds the two trying to one up Gus, in hopes of defeating him. Along the way, Walt’s brother-in-law Hank (Dean Norris) is getting closer to figuring out who the mass supplier of meth is. What results is, akin to the previous seasons, an all around addicting series. In all reality, Bad is unlike any series any other network can offer up. Some may say The Walking Dead or Falling Skies (both excellent series in their own rights) may challenge Bad; however, I disagree. Where these shows may falter and have an episode that is a bit weak, I challenge anyone to point out a ‘bad’ (pun intended) episode of Breaking Bad. The chemistry (pun intended) between nearly every actor involved, especially that of Aaron Paul and Bryan Cranston, is nothing short of phenomenal. The two play off each other in a manner that is rarely seen. They exude the exact right amount of emotion when need be, know how to handle each and every sequence, and act in a manner that makes you want to fire up the next episode immediately once you see the credits rolling. Speaking of flowing from episode to episode, I haven’t personally watched a series as addicting as Bad since the days of 24. Where the latter series succeeded (well, maybe outside the 2nd half of the 6th season) in creating pure, real drama, Bad is different in its addiction. The drama feels real, and the situations hit home. The idea of a family resorting to selling meth for support after your death is a topic that can resonate with anyone. Once we go, will my family have the support they need to carry on without me? That’s the ordeal that Walter faces each and every episode. Nothing he does is for personal gain, more to support his family. It’s ideas that are so based in reality, so based in family, that make Breaking Bad something truly, truly special. Almost something that comes along every so often and, literally, leaves you speechless. If you haven’t seen this series, definitely blind buy the 1st Season and prepare to be drawn into the world of Walter White. The series’ 1:78:1 framed, AVC/MPEG-4 encoded transfer is consistent, however, fails to meet the quality of the previous seasons. The main issue seemed to lie in how colors are dealt with from sequence to sequence. Take for instance Walt and Jessie’s lab. Here colors are bright, vibrant and ring out with detail. Move to the next scene, say an exterior shot and the problems arise. Colors seem to almost wash into one another. Not necessarily in a kind of blurry bit, but more in a distracting kind of way. Outside of this, grain is present, but nothing that is overbearing. Detail is mostly rock solid, especially in the aforementioned lab sequences. Generally, this transfer will please most fans; however, the more ardent videophiles out there may just shrug their shoulders a bit. 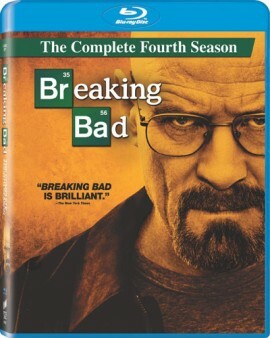 The Fourth Season of Breaking Bad arrives with the usual DTS-HD Master Audio 5.1 mix and, akin to the previous seasons, the track is excellent. Dialogue, whether the quieter Gus or the higher Walter, is well reproduced with no instance of drop out. The series has a solid amount of atmosphere. From the more emotional filled moments, to the heightened action sequences, each scene is handled well. Gun shots zip by, yet never overwhelm. Car tires screech away, yet never dominate. LFE, especially that of the opening title sequence, is deep and immersive when called upon. All in all, this is a well mixed track from the folks at Sony. Inside “Breaking Bad” – This is separated into 5 different pieces, one for each episode found on the disc. The pieces typically are close to 5 minutes each in length and feature cast and crew interviews, as well as plot synopses. Gale’s Karaoke Video – This runs 4:18 and is the complete video from which clips were taken from. Inside “Breaking Bad” – This is separated into 8 different pieces, three for each episode found on the disc, as well as a few others for different bits. The pieces typically are close to 5 minutes each in length and feature cast and crew interviews, as well as plot synopses. Inside The Explosive Finale – Running 23:13, this is a very informative behind-the-scenes look into the season four finale. Specifically this focuses on the shocking ‘explosion’. The Sets of “Breaking Bad” – This runs 8:55 and shows us how some of the series more popular locales were either created or found. The Invisible Driver – At 4:09 in length, this looks into the stunt driving for one particular sequence during the season. The Real Family of “Breaking Bad” – This runs 4:20 and has Creator Vince Gilligan showing us some behind-the-scenes footage of the crew filming. Better Call Saul Commercials – 2 different Saul commercials are shown. Video Podcasts – 13 different podcasts, one for each episode, are shown. They’re hosted by Editor Kelly Dixon. Gag Reel – 4:59 of the cast having a fun time filming. Cast Chemistry – At 5:41 in length, this shows the friendship actors Aaron Paul and Bryan Cranston built. Color Me Bad – This runs 4:42 and glances into the use of certain colors during the series. The Science of a Hit Show – At 5:35, this has Creator Vince Gilligan informing us of some of the earlier ideas he had for the series. Superlab Tour – This runs 3:06 and has Set Director Michael Flowers showing us around the set. The White House – A 3:55 tour of the White’s home. Cast and Crew Commentaries – Audio Commentaries on available on every episode, which was a nice surprise. The commentaries generally feature Series Creator Vince Gilligan, Actors Aaron Paul, Anna Gunn, Betsy Brandt, and RJ Mitte. Bryan Cranston appears on a few as well. Breaking Bad, simply put, is TV at its finest. The series is expertly acted (especially that of Cranston and Paul), brilliantly written and well-paced. Sony’s Blu-ray for this 4th season hits on all cylinders, even though the video presentation is weaker than the previous seasons. If you own the prior seasons, definitely add this one to your collection. If you don’t, blind buy the 1st season. Trust me, you won’t regret it. I love your use of puns :D But I believed it was pretty bad.